I don’t know you and, your god willing, you will never know me. Twelve years ago you brought a pup into your life. That was about the same time we were newly embracing three of our own; the same kind – Soft-Coated Wheaten Terriers. That’s about all we have in common. 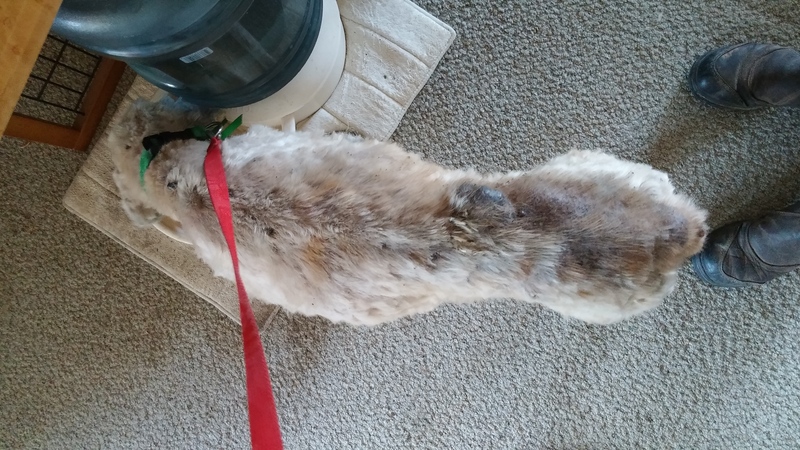 Her hair is matted to her body, her ears and eyes are dripping infection and swollen shut. Maybe you recognize her, maybe you don’t. Twelve years old. Most of the way through her doggy life and you dumped her. Well, actually you abandoned her. Call it coincidence, but she somehow ran away when you were packing and then you moved, out-of-state, and never reported her missing. Three weeks later, she couldn’t take her feral life anymore and in the unrelenting rainstorms that hit us last week, she braced herself against the porch door of an unknown house and would not move. She was brought to a high-kill shelter, because that’s what happens in these cases. Her intake report is catastrophic. But, get this: Even though she didn’t have a microchip or collar, they figured out who owned her. Isn’t that amazing? Wheaten terriers are so unusual in these parts and she’d been around your small town enough that people knew where she used to live. You said, “I don’t want her” and held to that, even after they told you the chances of her being adopted, given her advanced age and poor condition, are slim and zero. “Can’t take her, you said”. That whole new job thing and leasing an apartment that doesn’t allow pets and, oh, that girlfriend, who was supposed to be taking care of your pup in your absence, has now joined you, and she doesn’t like dogs. Well, that all makes perfect sense. Perfect. Now, in case this isn’t already clear, I find your actions incomprehensible — not a little bit; a lot. Incomprehensible is the nicest word I could hit upon and really, it’s too nice of a word for this. I can hold to the boundaries of that word though, because of the great and wonderful acts of mercy that your act spawned, acts that crack me open with gratitude. It starts with Shannon from the Animal Shelter, who knew your dog would not live the week without a miracle. So she started one. 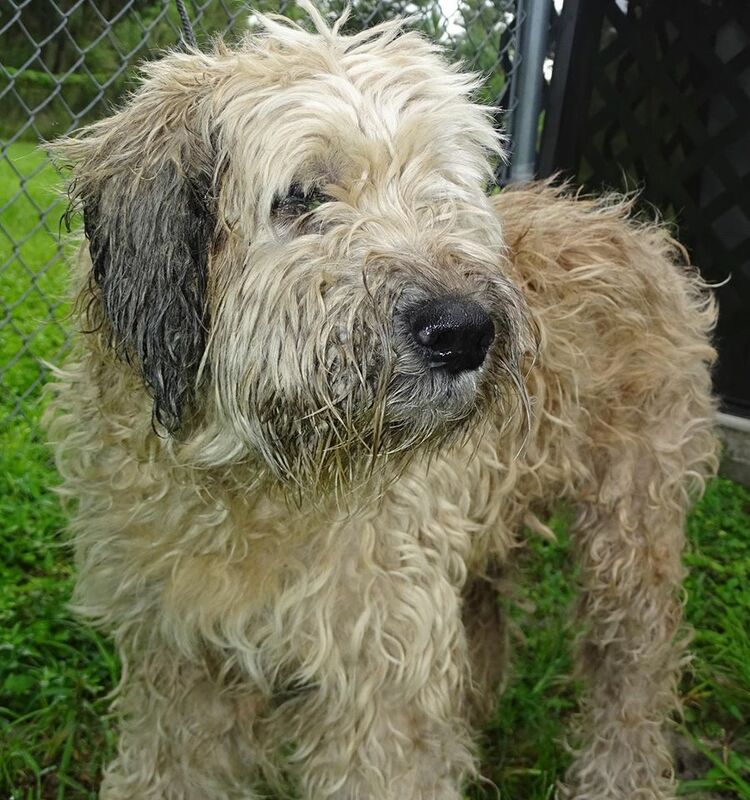 She found the Wheaten Rescue group here in Florida and sent them a most earnest and heartfelt plea. I have a copy of it and I will keep it forever, with gratitude for her kindness. Then there are Melissa and Sue, part of that Rescue, who put the notice out about your sweet pup. Complex placement: She needs a forever home and someone who will take her sight unseen. They committed to adoption fees and vet bills for the person who might step up. It was the kind of situation where you really, really hope that someone does that, steps up. 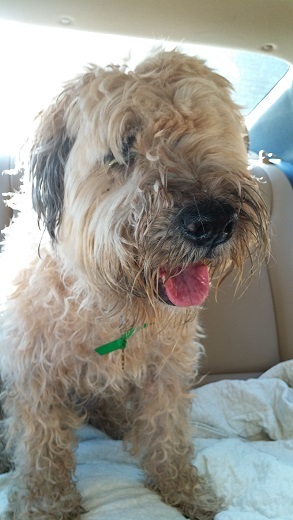 There just has to be someone who knows and loves wheatens, who doesn’t mind working through complex medical issues, who has a soft heart for the old ones. I can’t explain it, how I recognized her, how I recognized it was ours to do, but I did and Gordy stepped right up behind me. My wonderful, endearingly doting husband; such gratitude. Things happened fast then, because Sue made it happen. Within an hour it was all arranged. The Shelter is closed on Sundays and Mondays, but Shannon said to meet her at 8:00 a.m.and we could spring her. “She’s shutting down”, she said. “Any longer, and I think she will die of depression.” Again, to Shannon and Sue, huge gratitude. See how she isn’t really standing, but crouching, and avoiding touch or eye contact? She is lost inside herself, inside her own fear. Do you know what else Shannon said? That this is the worst intake they’ve ever had. Not the shredded up pitbulls or starving mama dogs. Nope, your dog. Years of neglect, they said. Years of confinement in a crate too small to stand up in. Untreated skin conditions resulting in infected open wounds. Total negligence in grooming, barely able to walk with the matting on her body. Pus oozing out her ears and eyes from chronic untreated ear infections. We did the paperwork and they gave us medicine to carry her through until we get her to our vet. The Animal Control Officer who picked her up stopped by and gave her a hug. They waived the adoption fee for her. Do you know what it was? Ten bucks. We gave them a donation of twenty. We figure she is worth ten times that. And then your sweet pup jumped right into the car with us. We talked and drove and drove and talked and, bit by bit, she joined us. We’re home now. We spent three hours giving her two bathes and a haircut. We had to hand scissor her very,very carefully because of all of her bumps and infections and the second bath was because the first one couldn’t even penetrate through the mats. She is running a temp and we know she’s not well so we are feeding her cautiously even though she is starving for food. We will know so much more when we see the vet tomorrow. So that is it. We are now a family of eighteen — the two of us, five horses, three donkeys, two mini horses and six, yes, six dogs. We are filled with gratitude for her existence in our lives. And, you know what, I think she kind of likes it here, so I’m hoping she is able to be with us a good long time. Oh, one more thing. We will never call her by the name you gave her. She has a new name to suit her new life. Everyone, meet Molly. Bless your hearts for caring to love this sweet baby. She is blessed to have you and you will be blessed ten fold I’m sure. Thank you,Shelley, and you are completely right about the blessing ratio! That is the sweetest, yet most heartbreaking story. That poor, poor pup! But it sounds like she’s got a good life now, and a family, and lots of love. I hate hearing stories of these poor, sad animals that have lived through so much abuse and neglect. I’m glad that Molly found a wonderful home. I wish I could see to it that all of them do. Maybe some day the world will be free of the cruelty committed against animals. Until then, I hope every poor, suffering animal finds a family just like yours. Thank you for your response and for the heart you show in your words. Relief of an animal’s suffering — I am in awe of the privilege. Spoken like a true wheaten lover. My consolation is that being a wheaten is what saved her. It broke their hearts, those good women at Animal Services, to see a dog like that getting such a bad deal. Grateful, just grateful. Reblogged this on Sarah Packford. Thank you, Sarah! Miss you!! Bless you for doing this. She looks so much like our little Sara that we lost last month at only ten years old. To think that they could have had more time with this sweetie and chose instead to just dump her. Those two people deserve each other. My feelings exactly. 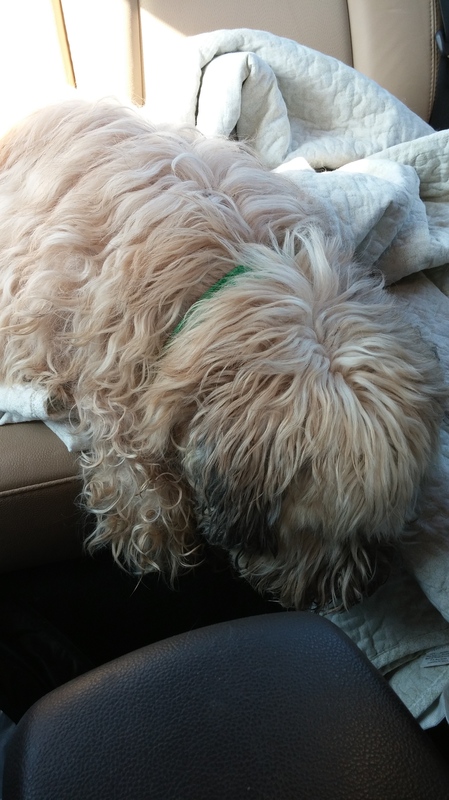 We lost two of our wheatens within months of each other last year — 11 and 12 years old. Too young. I feel for your loss of dear Miss Sara. It is never the same. Hugs to you. What a very sad story, but I am so glad she was rescued by your family. 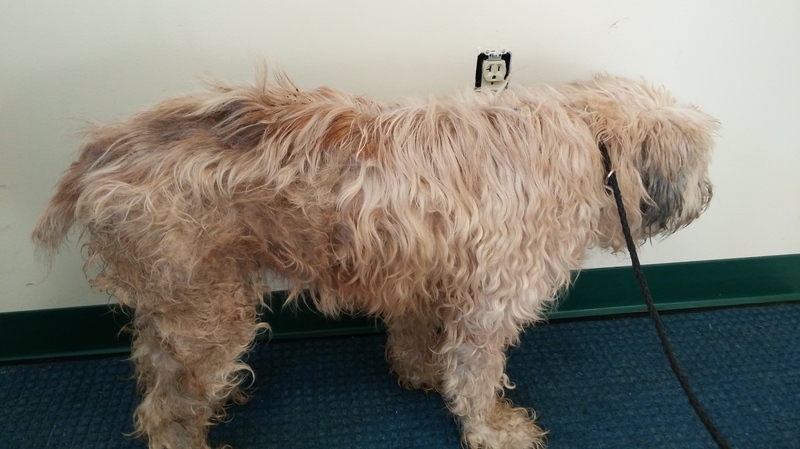 I volunteer for WIN, and I adopted my Wheaten from WIN over 7 years ago. Wheatens are the sweetest dogs. It’s one thing when a person has to surrender for complex reasons, but to abandon, it pretty cruel. I meant to write it’s pretty cruel. Jan, thank you so much for your kind and thoughtful words. I am in awe of how people, like you, care and feel so deeply for a dog they have never met and aghast at how uncaring and unfeeling someone was who called themselves her “owner”. Love, peace and security are beautiful, beautiful wishes. Lisa, already knowing the story of this sweet girl did not make reading it any easier. It is a sad story but then again it is a very happy story because of the kindness and caring of you and your husband. Lucky Molly, I think she found the perfect place for the rest of her days. A happy place and certainly better than with the terrible people who should have cared for and protected her. I truly believe what goes around comes around and there is a place for those people. Thank you for caring for this special girl. So agree — cared for and protected — the oath we must swear when taking an animal into our lives. I do not know what makes this deeply obvious to some people and is so disregarded by others. All I know is that Molly waited too long for that to happen for her and that we are the lucky ones who get to show her how very much she deserves it. It’s been a year already! Those of us who shared your story are seeing it pop up again on FB. How are you, your menagerie and sweet Molly? How fantastic! 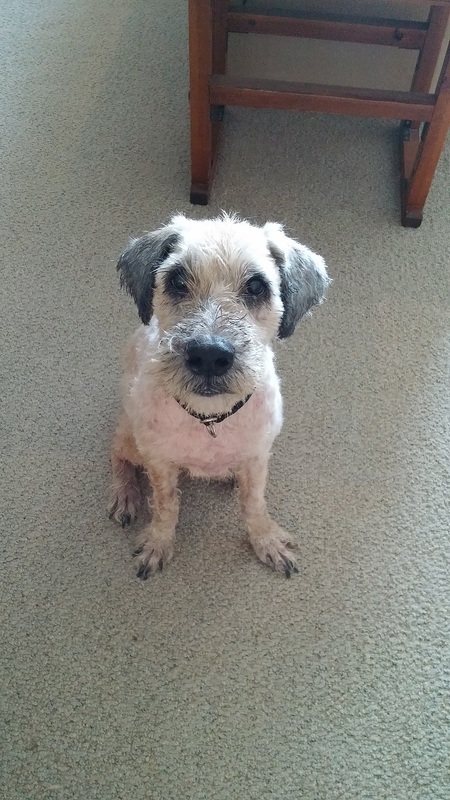 I just did a public post to my Facebook page with an “after” picture of Molly. She is doing so very well. Thank you so much for asking!